The John A. Garza Lifetime Achievement Award is sponsored by the Arizona Industry Liaison Group (AZilg) and acknowledges significant past Equal Employment Opportunity/Affirmative Action and Diversity accomplishments and continuing contributions by an exceptional HR practitioner in the field of EEO/AA/Diversity. 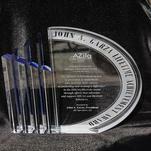 This award was established in honor of John A. Garza, President of JAG Specialties, LLC. Mr. Garza’s dedication to the principles of equal employment opportunity, affirmative action and diversity span a period of 38 years. He has been a member of the AZilg (formerly, Arizona Affirmative Action Association or Quad A) since 1975 and has served as Recording Secretary, Treasurer, Vice President, Past President and President of this association since 1999. This is an annual recognition award and will be presented at the Annual AZilg Compliance Conference in November. Applications should be received no later than July 31st.